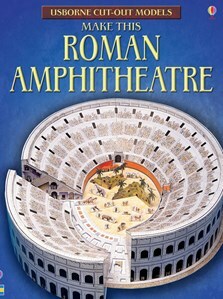 Printed on stiff card, this book contains templates to cut out and construct an historically accurate model of a Roman amphitheatre crammed with fantastic details. The completed model is 52cm in diameter and 11cm high, and includes a lift-away section of the walls to reveal the rooms inside. Includes cut-out models of gladiators and props to stage mock sea battles or games to entertain the crowds.